Room in Ligon Hall decorated by Dorm Decor. First-year students live in either Ligon Hall (women) or Searcy Hall (men). Hall events, programs, and gatherings enhance your first-year experience. In addition, Resident Assistants plan social, cultural, and educational events each month. Sophomores, juniors and seniors may live in Blount Hall. Blount rooms are in three styles: hotels (2 students), suites (4 or 6 students), or clusters (6 students). Within each room, residents share a common room, bathroom(s), storage closet, and small kitchenette (refrigerator, microwave, sink, and cupboards). Resident Assistants focus programming toward upperclass residents. Huntingdon also offers more independent living in several spaces on- and off-campus, including Hanson Hall, Trimble Hall, and several houses on College Court. These spaces are reserved for upper-level students. Resident Assistants live on each floor and serve as the caretakers of the residence halls. RAs assist students with adjusting to college life, maintain and enforce College conduct standards, and help students become involved in college life. Each residence hall also has a full-time Residence Director who oversees the building and RA staff. The Office of Residence Life is part of the Office of Student Affairs, located in The Hut. You may contact Res Life for information about living on campus. We are here for you! 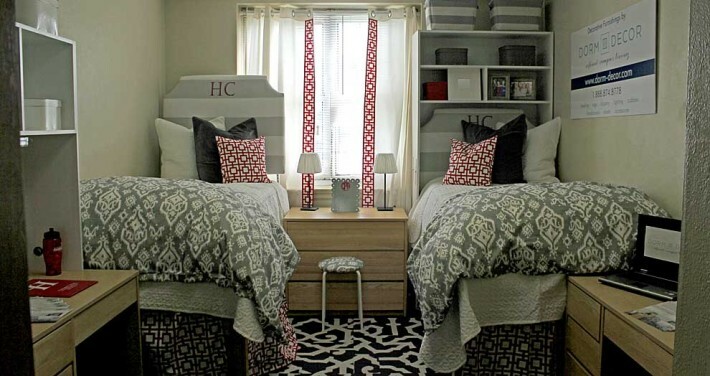 Home of the original Dorm Cubby, Dorm Decor offers everything a college student needs to decorate a dorm room. From functional to luxurious, Dorm Decor’s carefully curated collections make for a unique and custom look. Stop by the model dorm rooms for inspiration and a look at some of our favorite pieces! Dorm Decor serves a national customer base from its headquarters in Birmingham, Alabama. Visit the showroom at 3105 7th Avenue South, Birmingham, Alabama 35233, or shop online at dorm-decor.com.